Want to know how to save a snowflake? Learning all about the weather can be super fun! Here you'll find everything you want to know about working at a weather station to learning some fun snow trivia. Enjoy some laughs while watching our videos of meteorologists and the funny things they say and other fun weather stuff! Make Snow: See How To Turn Boiling Water Into Ice Crystals Instantly! Did you know you can turn hot, boiling water into ice crystals in a matter of 1 or 2 seconds? It’s true! You have got to check out this amazing video and see for yourself how neat this is! Now you can bring your snowflakes inside, thanks to this clever little trick! See how to save snowflakes for 10 years or more with these instructions. Some snow trivia for you. 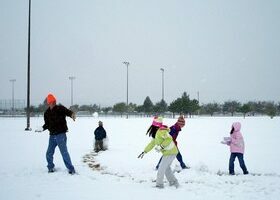 Plus, some fun things to do with the kids to enjoy the wintry weather. 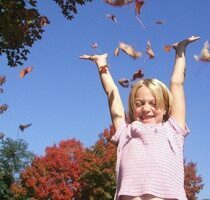 Along with the fun you and your kids will have studying fall colors, recording the weather, and trying to guess what Mother Nature may bring next… your kids may also have the foundation of a blue-ribbon winning science project for the next school fair! Perhaps you’re wondering how the weather affects fall colors and how foliage actually changes colors in the fall. Here are some tips. How To Throw A Rain Party – Simple & Fun Rain Play For Kids! A Rain Party is Mother Nature’s water park — and it is quite a bit cheaper than going to an actual water park. As long as lightning is absent, cold weather is far away, and your yard can accomodate little feet jumping, dancing, and playing in the rain, a Rain Party just might be the thing to cool off your kids on a hot, summer afternoon! 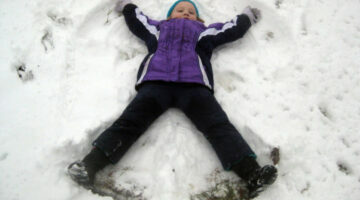 Here are lots of fun winter activities that you can enjoy with kids out in the snow. Everything from creating snow art, making snow sculptures, and making snow paintings to making your own backyard skating rink, and other fun snow games to play with kids. 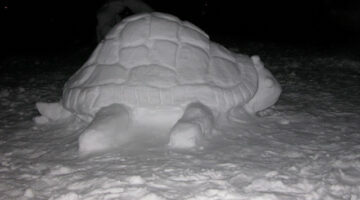 The art of making unique one-of-a-kind snow sculptures using just snow and some common household items you probably already have lying around. 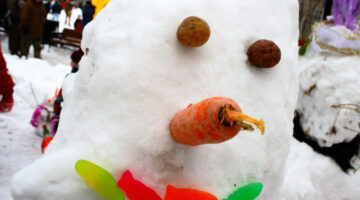 8 Tips For Making The Best Snowman… Ever! Here are some great tips for making a snowman look totally cool — for yourself and your neighborhood! Eight things that will set your snowman apart from all the rest. 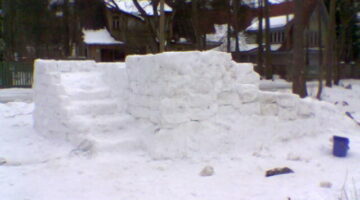 A snow house is made very similar to an igloo, except it is rectangular and doesn’t include a roof. Last year, we made 2 snow houses which became castles and forts that all of the kids in the neighborhood enjoyed playing in. How To Make Fake Snow: 12 Ways To Get Instant Snow In Minutes! 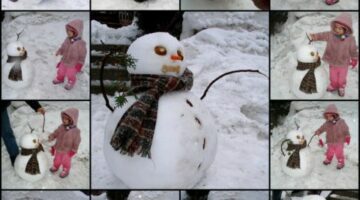 Here are pictures of some of the most creative snowman shapes, faces, arms, and clothes. Plus, fun miniature snowmen too! Use these ideas to make your own one-of-a-kind snowman! New England Fall Foliage Tours… By Train! My husband and I took a trip to New England to do a little leaf peeping. We had heard that this was a marvelous area for autumn foliage and it far exceeded our expectations. 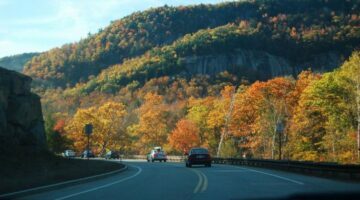 Here are photos and details of our fall foliage train ride through Vermont, New Hampshire, and Connecticut. By using your imagination and a few inexpensive craft supplies, you can create beautiful autumn crafts that will add some charm to your home decor. 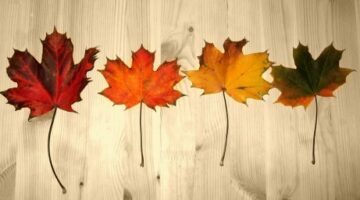 Here are 4 fun craft ideas using autumn leaves. Preserving Fall leaves is one of the best ways to decorate your home during the autumn months. And it’s always fun to make little mementos that include colorful leaves that you’ve collected. Here’s how to preserve your leaves. Recently, I took my mother and grandson on a trip the to Muskoka area. While there, we explored the Lake of Bays region and Huntsville, Ontario. Here are some fall foliage photos and tips if you’d like to make the trip there yourself. Let it #[email protected]$% Snow! Here’s my Super Bowl prediction! It’s highly scientific and has been proven to be accurate 50% of the time! 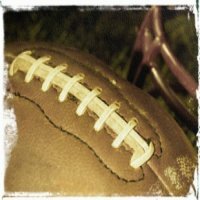 Count on TheFunTimesGuide to Weather to give you the first score prediction for Super Bowl XLII! The super-secret scientific formula is revealed here. 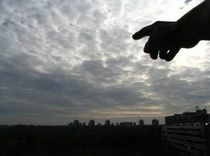 Looking for some great pictures of the Amazing Skies above us? NASA has some great photos from space! Kids can have a lot of fun learning about weather and the power of nature. Children can learn from respected sources about Hurricanes and tornadoes… weather safety and emergency procedures… and everything in between! Predicting the Super Bowl winner can be tricky business. So, why not use weather as your baseline? Here’s a surefire formula to predict the winner of any football game. This formula has been proven to work . . . about 50% of the time! What are the chances of a white Christmas at your house? Statistics and forecasts help us figure that out.